Do you have a dessert or pastry that receives rave reviews every time you make it? Have you ever wondered if your product would be successful on the market? Are you in need of additional income or a getaway from your current job? A favorite product that you’ve made time and time again, could be the answer to your questions and your financial dilemma. You could be holding the recipe for the next million dollar pastry. Generally, repeated compliments from mixed audiences, suggest that your product has market potential. Restaurants, cafés, sandwich shops, caterers, hotels, local retail shoppers, online shoppers, etc. are looking for new products; and quality products are always in demand. Now, before you begin selling those wonderful baked goods, there are essential things that you must put in place to make your business legal. While there are many important steps to starting your home-based baking business, I’ve decided to focus on the two most important that will lay a great foundation for a successful home business. The first step in setting up your home baking business is finding out if you will be able to acquire the necessary licenses and permits to operate the business. Before continuing with this step, I should tell you that you will not be allowed/licensed to prepare food for commercial sales from your personal kitchen (the kitchen used to prepare your personal meals). You will be required to setup a separate kitchen for the business. It is my understanding that every state in the U.S. enforces this regulation/health code in addition to others. Your local governing agencies…business license office, zoning department and department of agriculture/health can answer any questions you have concerning regulations and preparation of work space as they pertain to your area. Keep in mind, not all cities, counties and states have the same ordinances, regulations and codes. For example: ordinances in your city or county might prohibit the operation of food businesses in the home, OR, the location of your home might fall in a restricted zone for home-based food businesses. Invest a little time and effort in a few phone calls or in-person visits to these offices. Once you have a “YES” response that will allow you to set up a home food business, the next steps are: choosing a room or area of your home for baking, getting estimates for renovations, pricing equipment (only what’s necessary for startup), creating a much needed startup budget and writing a business plan (even if brief, for your personal use only). Because many questions have been asked concerning the difficulty in setting up a home baking business according to codes and regulations, I felt it necessary to briefly discuss the subject from an experienced point of view. The level of difficulty in setting up your home business is, more often than not, minimal in comparison to opening a bakery in a commercial location. The amount of work to be done will vary, for each person, depending on the current condition of the designated work space. If the chosen work space has no electrical wiring, plumbing, finished walls or covered floors, of course, your startup cost will be more than it would be if some of these things were already in place. To make an informed decision, you must first determine the actual cost of renovation. Don’t leave out any cost, not matter how small. It can negatively impact the bottom line. Before making a final decision concerning whether to embark upon this project, weigh the cost you calculated against your needs, desires and determination to have a home- baking business. Several years ago, I personally setup and operated a home-baking business. It was done according to the regulations and codes of my county. I can tell you that the entire project was far less expensive than leasing, renovating and maintaining a commercial location. One of the many attractive features of operating this business from home is that you have the time to create/renovate the kitchen space at your own pace without paying additional overhead. My renovation took place over a 3-4 month period. My lean budget dictated I complete one task at a time with sometimes a long pause between. However long it takes to get your kitchen up and running, you have that time with no additional overhead or money pressures. If baking is an area of interest for you, stop sitting on the sidelines. You owe it to yourself to explore the possibilities. Don’t be discouraged by unfavorable comments from others. Do your own research. Find out what’s involved. Find out if this is doable for you. After all, there will be challenges with any business that you start. Passion and enthusiasm, for your product and the business, can open doors to part-time income. With continued interest and persistence, your part-time endeavor could blossom into a sweet, lucrative, full-time baking business. 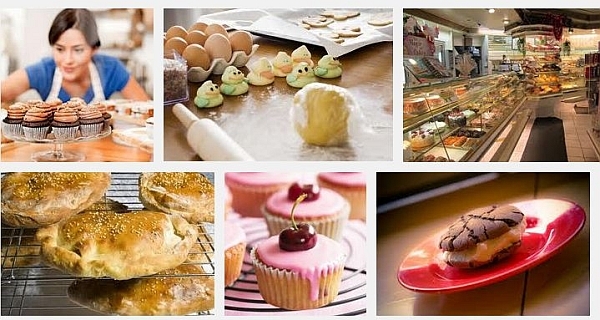 For more information on starting a home based baking business, low-cost alternatives to starting a baking business outside of the home, creating a budget, writing a business plan, purchasing equipment, marketing, setting prices, baked goods to gourmet gifts and more, visit my website @ http://www.BringingHometheBaking.com. Quincella C. Geiger, business owner & author of “Bringing Home the Baking”– How to Start a Licensed Home-Based Baking Business.